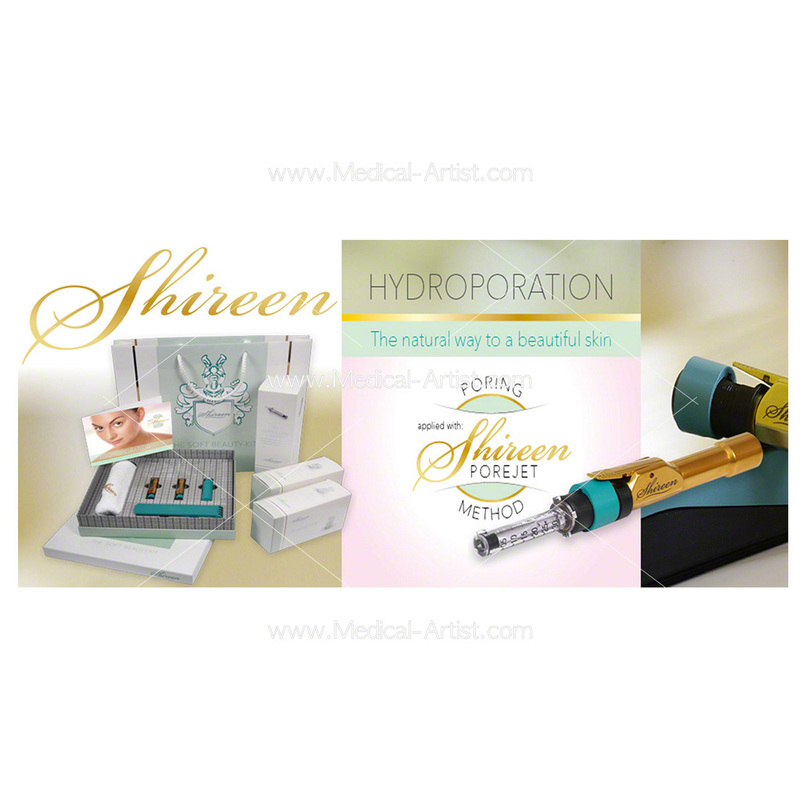 The Shireen Poring Method is a unique, needle-free and virtually pain-free injection method for administering the specially developed Shireen Dermal Filler within the skin. Using the same technology that has been successfully used to administer insulin and dental anaesthetic. The device itself is pen sized and has a spring mechanism that delivers a very small ampoule of solution (less than 0.3 ml) into the dermal layer through a hole only 0.18mm in size. Within a fraction of a second the Shireen Dermal Filler will be deposited within skin with the aim to instantaneously reduce fine lines wrinkles. 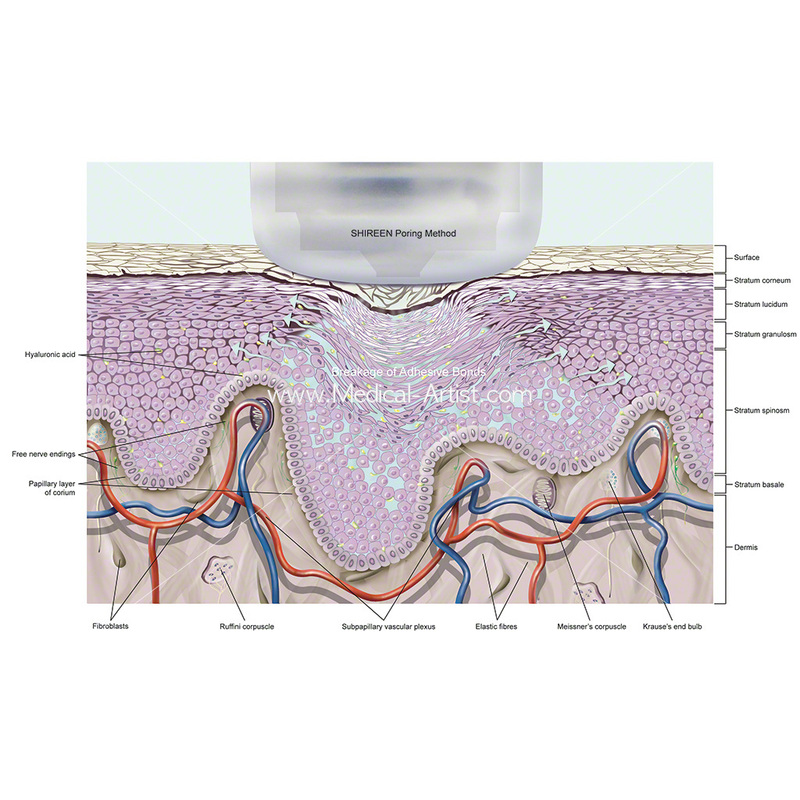 Advantages Trials with the medical solutions and system have shown that the extremely fine jet of Hyaluronic Acid gently penetrates the Dermal Layer of the skin and selects the path of least resistance. In effect there is no damage to blood vessels, nerve fibres or osseous tissues have been observed. Potential for less tissue damage than for needle application. Use of the Shireen needle free injection system is less painful because the skin is penetrated by an extremely fine jet of medication. This is a tremendous help to patients who are uncomfortable or fear the use of needles. 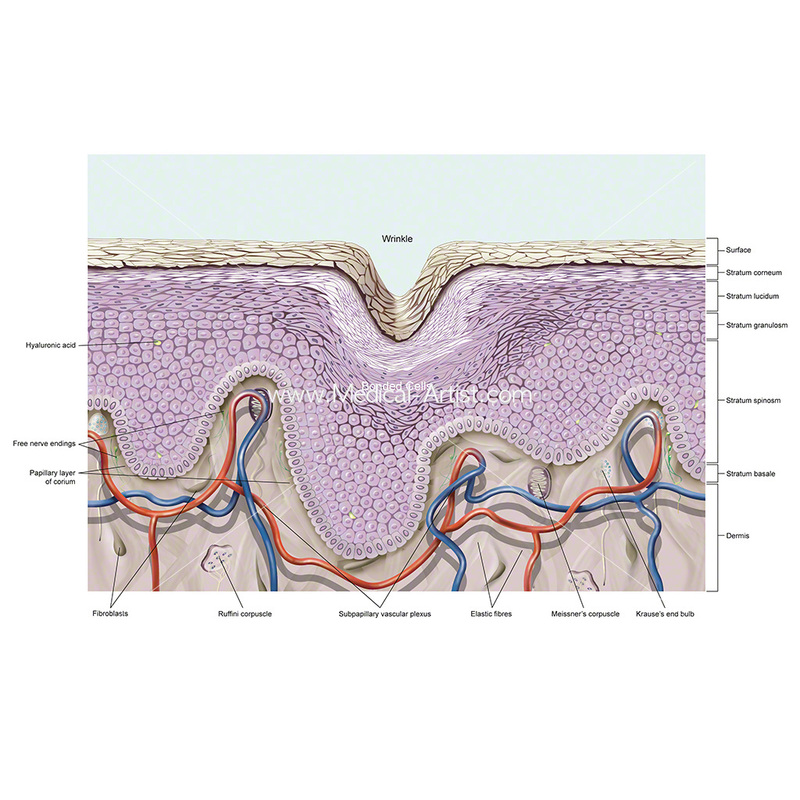 Looking at the written description within the brief we decided to supply three medical illustrations of the cross section of the skin at a highly magnified view. 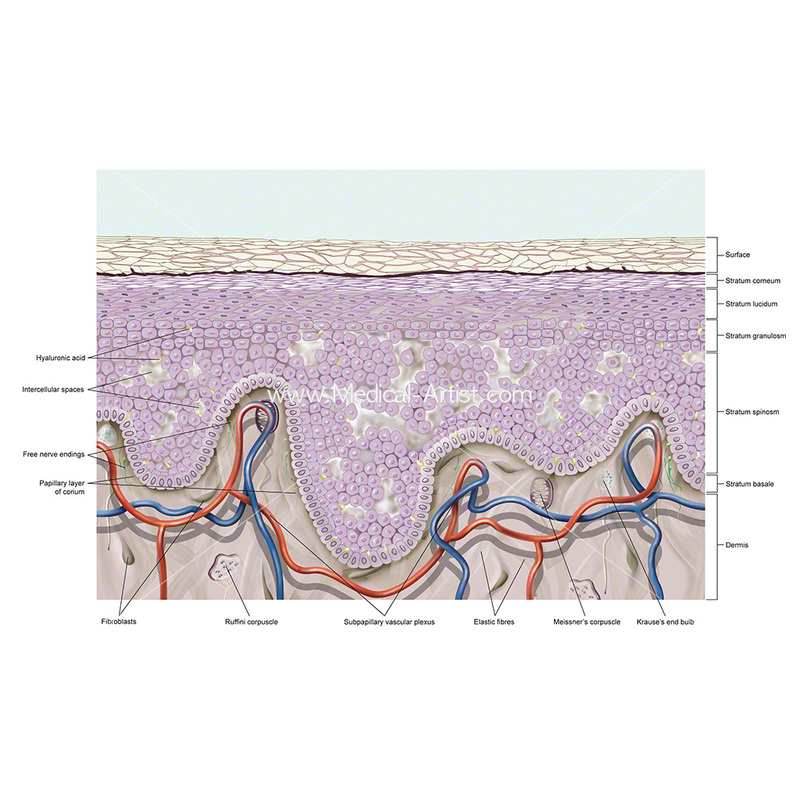 Our purpose to show the affects of the Shireen porting method in and on the skin. We created three stages showing healthy skin, skin with a wrinkle, and skin after the Shireen method had been applied. 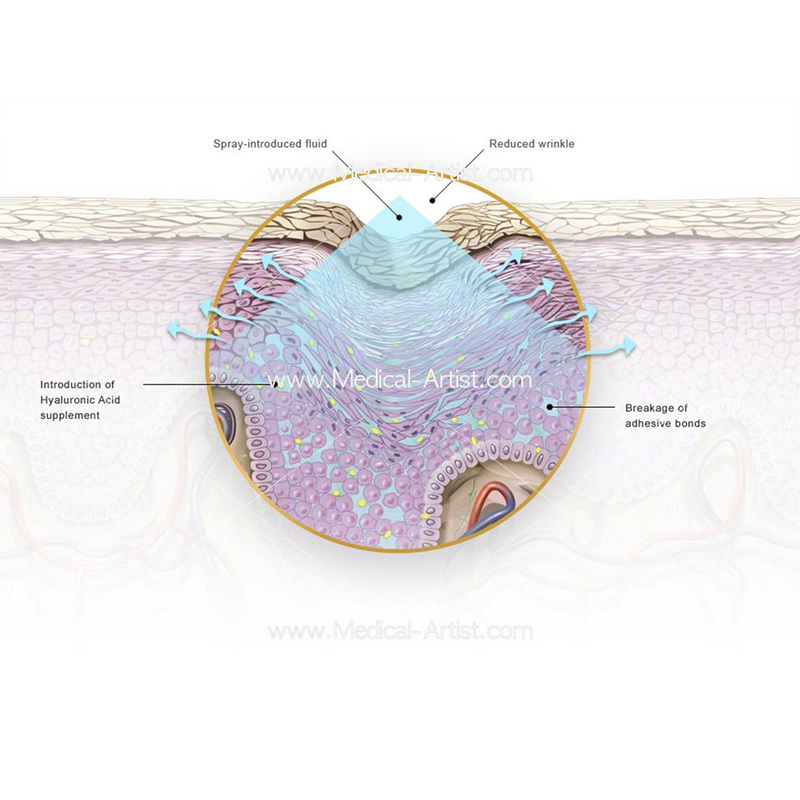 The medical illustrations were required to show the layers of Skin, Cells and Molecules naturally present within each layer such as Fibroblast Cells, Collagen, Elastin Fibres, GAGs, Hyaluronic Acid, Mannitol and Anatomy & Physiology structures such as Hairs, Blood Vessels, Nerves, Muscles as illustrations displaying how the Shireen Poring Method of delivery interacts, travels and creates internal and external effect and result within and upon the skin. The medical illustrations to be used within the sales presentation to clinics, to demonstrate the technique to training administering practitioners and users and training sales team. To communicate to the audience how Shireen Works highlighting their USP’s ensuring an unquestionable strong market positioning.